On October 30th 2013 the Spanish Official State Gazette (BOE), published Law 16/2013, of October 28, 2013. That Law modifies the matriculation/registration tax exemption established by the Spanish Excise Duties Law (Law 39/1992) for vessels effectively and exclusively engaged in the charter activity, eliminating the reference to the maximum length of 15 meters that was required under the previous wording of the Law in order to benefit from the tax exemption. In order to start a charter activity shall be necessary to get a double permission (national and regional). The position of the Spanish Marine authorities is keen to accept that non EU flagged vessels can obtain a charter license, provided VAT position is resolved. The main difference compared with an EU flagged vessel is that it would be necessary to apply for a special permission to the Merchant Marine Directorate in Madrid, in addition to the authorization of the local office of the Marine Authority of the region where it is intended to be chartered. From an administrative perspective and with regards to non EU flagged vessels, some local governments (e.g. Balearics) establish restrictions to the possibility of carrying out charter activities with non EU flagged vessels. With regards with the place of supply of short term hiring of a mean of transport, if the vessel is put at disposal of the client in the Spanish territory, Spanish VAT will be due. Referring the percentage of VAT applicable to charters occurring in Spain, the charter services rendered in Spain are subject to VAT at 21%. Instead of what is happening in other EU countries, there is no option to apply a reduced VAT for charter services rendered in Spain. In case of a charter starting a non-EU port and terminating in a Spanish port VAT, theoretically VAT would be due on the total navigation performed in the Spanish waters. VAT is due on the APA amounts independently if all the invoices charged to the APA are under the name of the final client. If the invoices are under the name of the boat, the VAT must be added to the final invoice from the boat to the client. It will be paid by the fiscal representative to the Spanish Government, together with the VAT due on the charter fees. The current situation in Spain is that provisioning to commercial vessels engaged in charter activities are subject to VAT. Sneed Charters team will be more than happy to assist all Clients interested in cruising in Spain providing them all necessary information and support with local authorities. Please do not to hesitate to contact our office, we always stay at your entire disposal 24H/day. 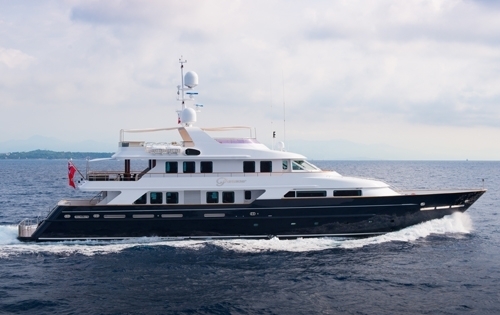 We are pleased to announce that the 44m motor yacht PARAMOUR is available for event charters. PARAMOUR is now available for charter during the prestigious Monaco Grand Prix 2014 & the Cannes Film Festival. The owner is offering free berthing for a 6 day charter from the 19th-25th May for the Cannes Film Festival. Built by CMN Cherbourg in 2002, motor yacht PARAMOUR had a full refit in 2012 and can accommodate up to 10 charter guests in 5 luxurious staterooms, as well as carrying a crew of 9 on board. A €10,000 security deposit, extra catering and soft furnishing protection are required for static charters. Built in 2007 by Benetti, BLUE VISION is a stylish and practical charter yacht, perfect for navigating the beautiful azure waters of the Mediterranean this summer. BLUE VISION boasts vast interior and exterior space with luxuriosly elegant styling. She had a full refit in 2010 and offers comfortable accommodation for up to 12 charter guests in 5 staterooms including 2 Pullman berths, in addition to 9 crew members. Featuring an on-deck Jacuzzi, large sun deck dining area and a fantastic array of water toys, her experienced and professional Captain and crew guarantee the yacht charter vacation of a lifetime. Croatia Goverment raise tax for yacht charters. Belle Aimee 52m is available for charter during March and April in Fiji. Good alternative for your clients who are bored with the Caribbean and Med. September to December 2014 – Malaysia, Thailand, Burma, Indonesia. Extensive dive equipment including Nitrox with dive master for guests. 88m Maltese Falcon Available in the Caribbean starting holidays. February Panama Canal transit and on to the South Pacific and Asia for Spring Summer 2014! Visit Panama, Galapagos, Costa Rica, French Polynesia, Thailand and more. Luxury sailing yacht ‘Maltese Falcon’ provides the following superior Guest Accommodation for 12 guests in 6 cabins. VIP cabin on upperdeck with queen berth. Full beam Master with King berth, a seperate full beam dressing room and private gym on lower deck. Four guest suites that can convert into two enormous VIP suites each with his/her heads. All cabins have King or Queen berths.